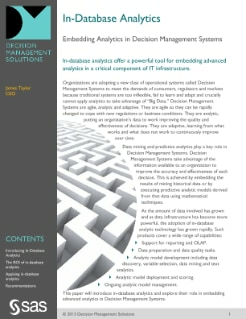 Traditional operational systems are too inflexible and crucially cannot apply analytics to take advantage of Big Data. That's why some organizations are adopting a new class of operational systems called Decision Management Systems. Agile, analytic and adaptive, these systems are designed to meet the demands of consumers, regulators and markets. This paper introduces in-database analytics and explore their role in embedding advanced analytics in Decision Management Systems.